Munich, February 14, 2019 – Devexperts, a financial software developer, announces the enhancement of their AI-powered chatbot Devexa with a voice trading capabilities. Devexa is an AI-powered live assistant developed by Devexperts for retail brokers. It is available on Facebook Messenger, Viber, Telegram and soon to be launched on WeChat. 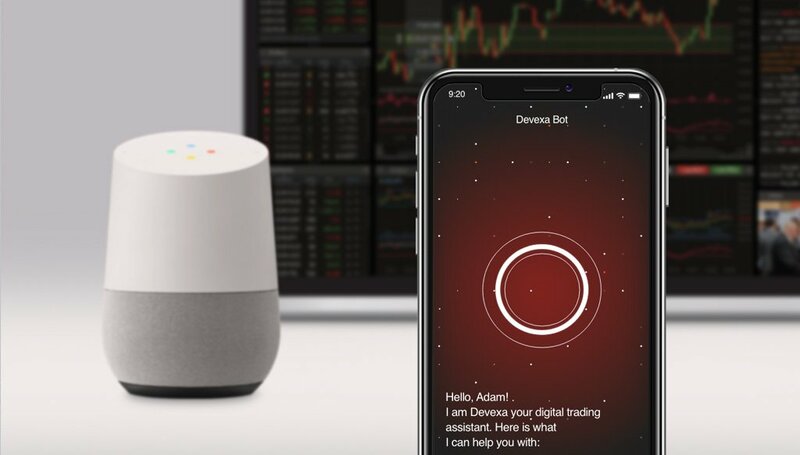 With the new voice control update, traders can communicate with Devexa over Google assistant. Anthropomorphic communication with chatbots allows for first line support automation for brokerages, saving manpower to focus on more complex tasks. Its integration with CRM and back office systems helps to retain the broker’s existing clients, and to onboard new traders. Devexa ChatBot is a software with conversational voice and text UIs, and an AI technology to understand natural language. The users can request real-time quotes, charts and fundamentals from the chatbot, reach out to the broker’s help desk instantly, and save time by texting and voice typing. For brokers this chatbot represents a new engagement channel, which is aimed at boosting their clientele base and their affiliate business. In messaging applications Devexa has enhanced NLP capabilities and is able to understand typos and ambiguous text. There is no need to download and install a specific app to access market data, the users need to simply add Devexa ChatBot to a messenger of their choice, and they will be able to obtain market updates, check their balance, pending orders, positions, and even execute trades. The chatbot can also reply with UI elements, such as charts for different time periods. There are shortcuts in form of buttons for common requests, such as requests to receive quotes for most-traded shares, futures, cryptocurrencies or FX pairs. The chatbot tracks a user’s input from one interaction to the next, allowing the broker to take advantage of previously entered information when offering personalized offers. Devexa can be white-labeled and tailored to a broker’s preferences. This includes not only the branded widget integrated into the trading platform of a broker, but also for different work-flows, knowledge bases, and data sources. Devexa can educate new users, assist them in an expedited on-boarding, and demonstrate their chosen platform in a hands-free, natural way.